Whio and Scaup, below. From Buller’s Birds of New Zealand: Illustrated by JG Keulemans. Whio live only in Aotearoa. In 2003 they were placed on the IUCN red list of threatened species. They are classified as nationally endangered. ​Once widespread, Whio are now endangered because their small population is fragmented and has rapidly declined due to introduced predators and habitat destruction. As few as 2400 are left and maybe only 1000 breeding pairs. Now they are confined to steep wild rivers with forest cover overhead and vegetation to the water's edge. Whio nest near steep stream banks, in caves, cavities, or under dense vegetation. They lay 4-9 eggs, and can breed in their first year. Each pair requires a territory of 0.7-1 km of river. They pair bond for a season or life. Male birds have been known to live up to 12 years - female Whio don't seem to live as long. 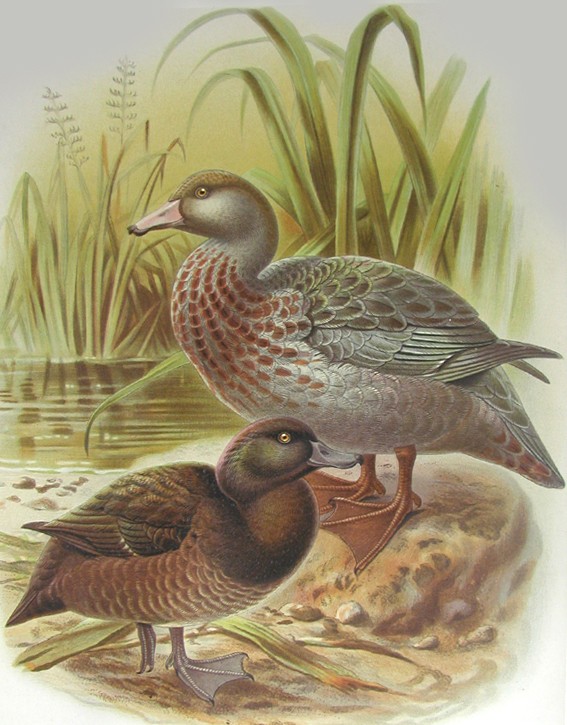 Whio eat insects and aquatic invertebrates, primarily caddisfly larvae. They feed and live on fast running water. They have incredible buoyancy, special webbed feet that fold up for aqua-dynamics and a soft tip beak for hoovering larvae from rocks. Whio are camouflaged to match river rocks. Adults have chestnut chest feathers and yellow eyes. Male Whio whistle like their name..”whio whio”. Females make a gutteral rattling sound. Threats to Whio: Stoats, rats, cats, possums, farming and Hydro schemes. 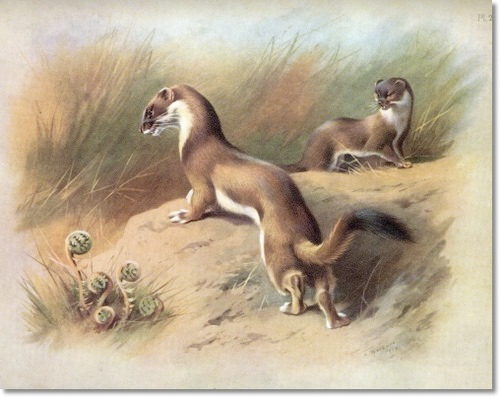 Stoats steal eggs from nests, even from under incubating females. They will attack nesting birds and eat young. They are natural born killing machines. Eggs are also taken by possum and occasionally by Weka. The greatest predator threat for Whio occur after beech mast years. Rodent populations explode, causing a lagged increase in stoat populations which seek alternative prey when rodent numbers crash. They are also very vulnerable when they are molting and are flightless. Their natural instinct then is to seek shelter in side streams. Here they are safe from overhead attack but are actually closer to stoats. Agricultural grazing and clearance of waterside vegetation has decreased water quality and led to the species's disappearance from lowland rivers. Hydroelectric dams in sensitive areas altered rivers and reduced available habitat. Whio Forever, the conservation partnership with electricity producers has remedied many of these effects and helped to protect and promote Whio conservation. Introduced trout may compete for food and birds have been caught in discarded fishing line. The Didymo has reduced habitat quality. Whio cannot be rescued by taking them to safe off shore islands. They need space on fast flowing rivers to survive. They do not live happily close to each other. There are eight security sites where WHIONE and captive breeding, and predator control, are helping to secure the existing population. This is mostly DOC work along with sponsorship from Whio forever. The aim is to get 50 breeding pairs at each site by 2019. Recovery sites are other small areas across NZ where Whio are just hanging on. These areas have some DoC help and a lot of voluntary efforts to protect the birds. In 2014 the southern Ruahines Whio were listed as a recovery site. This is heartening recognition that shows what we are doing is worth it. Whione: Whio operation Nest Egg. Wild bred eggs are collected and raised in captivity for release back into the wild. A slow and expensive way to increase numbers. Captive breeding. The aim is to increase numbers and widen the genetic base of populations. This involves breeding, hatching, raising and hardening birds before tagging and release into security sites. Breeding has successfully helped bring the Whio back to Egmont National Park; Mount Taranaki.